This weekend we decided to play tourist. So Friday after work we headed out to Girdwood and booked ourselves into the Alyeska Resort. This place is pretty famous as one of the better ski resorts in the winter. What we didn't realize is that in the summer it is a main event attraction as well. A quaint town with a lot of hiking trails etc, and usually some event or other going on each weekend. We were lucky to get a room and the price certainly reflected that, but hey you only live once. The first night we hit the sushi bar for some very missed sushi, sashimi, and sake. All things we were spoiled with in Japan. And we're not let down and other than the fact the sushi chefs were not Japanese it was on par with what we were used to in Japan. By the way they had spent several years under Japanese chefs learning the trade. The next morning we decided to hike to town for brunch. Great lunch, great hike and it tired us out enough to take a shot nap before we took the tram up the hill for some more hiking. After our hiking we hit the pool and hot tub and up to the bar for dinner. The next morning we set out early for Whittier as we had a cruise set up. We visited two glaciers Beloit and Blackstone. Blackstone was used in the movie Fifty First Dates. The cruises in Whittier are pretty neat and a lot different from the cruises in Ressurection Bay. Don't get us wrong we like cruising in both places. It is one of the neat things about Alaska. Two places offer the same thing but they are very much different. One of the other passengers kind of made a similar analogy. 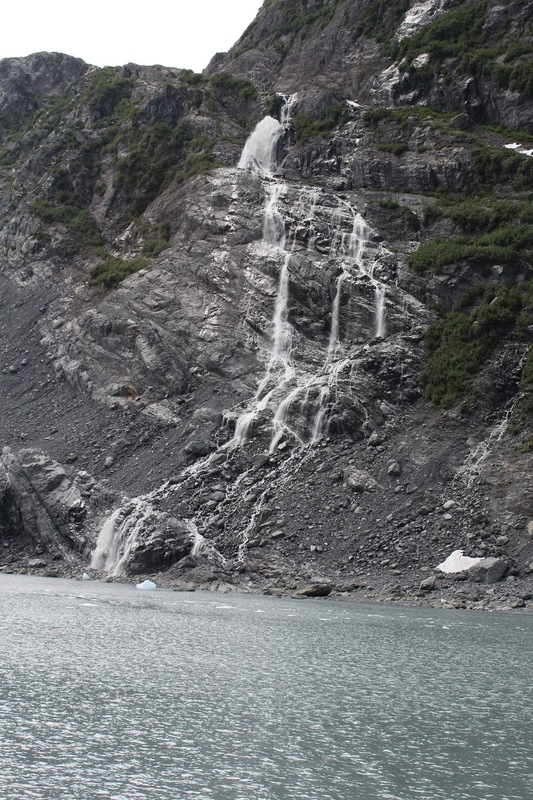 At Beloit glacier there was a waterfall, one of the most spectacular ones we have ever seen. He said, man anywhere else in the world people would drive hundreds of miles just to see that waterfall. Here everyone is seeing it as an aside. One other thing interesting about our trip to Whittier was this was our first trip through the tunnel. This is a one lane tunnel, shared by trains, and motor vehicles which have to go in both directions. 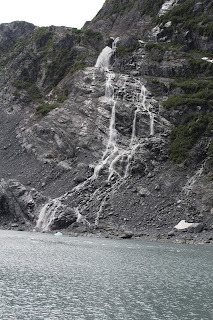 It was built as an emergency tunnel in case Seward fell to the Japanese. It is still the second longest tunnel in North America and it is the longest one that is used by both motor vehicles and rail.